The emergence of new forms of technology in the past 20 years has dramatically increased the scope for cross-border IP disputes. While Australian courts have traditionally been reluctant to adjudicate claims concerning foreign IP rights and restrictive in their enforcement of foreign judgments, this article advocates a more liberal approach to both issues that should assist claimants to obtain greater redress in future cases. Specifically, the current subject matter jurisdiction bar on determination of cases involving foreign IP rights should be replaced with a discretionary appropriate forum test and new grounds of indirect jurisdiction should be created to allow increased recognition and enforcement of foreign judgments on IP matters. A significant question in the debate about a registration system for geographical indications (GIs) for food products other than wine is whether Australian registered GIs could provide useful protection in important markets such as Japan and China. Those countries have both regional collective trade mark and sui generis GI registration options, as do other Asian nations. The GI registers are open to foreign applicants, but only where the application is based on a domestic registration in the source country. This is an argument in favour of establishing a GI register for food in Australia. The sui generis GI protection regimes in China and Japan also offer considerable forensic and substantive advantages compared to trade marks and reliance on unfair competition laws. IP protection is fairly absolute in a manner analogous to Australian wine GI laws, and the authorities are more engaged with policing and enforcement of GIs than of trade marks. A definition of the public domain by Greenleaf and Bond, based on the question “what can users do with works, without obtaining the permission of a copyright owner” and an analysis of it as being comprised by 15 distinct categories of “public rights”, has previously been proposed as necessary and sufficient to describe Australia’s copyright public domain. This article uses this approach to compare Australia’s copyright public domain with that of the very different social and legal system of the People’s Republic of China, and discovered that, compared with Australia, China’s public domain appears rather narrow, at least when only formal legal sources are compared. Out of the eight categories where the two countries differ significantly, Australia’s public domain is stronger in five. The public domain in modern Chinese copyright law is, not unexpectedly, somewhat different from that found in a “western” country such as Australia, but not in the radical way that could be naively expected to stem from arguments concerning China’s traditional philosophy, or its socialist modern history. The harmonising effects of international treaties and the pressures of international trade are the most obvious reasons for the relatively high degree of homogeneity. This comparison also suggests that the definition of the copyright public domain used requires modification in order to include China’s opt-out provisions in relation to free-use exceptions and collective licences. However, the comparison does not suggest that any new public domain categories are needed. 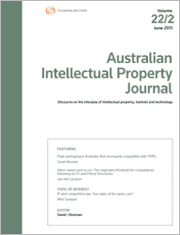 For the PDF version of the table of contents, click here: AIPJ Vol 27 No 3 Contents.